Due to regular basis update in google algorithm We are unable to find destination point of SEO success So we try to modify our SEO strategy to catch up latest trends. In SEO today's strategy may become old in tomorrow so We need to update self . After long journey on this platform and working for multi national company of India and Globe I relies if We track user interest and mind of our business market place then We will able to plan for our business. In SEO customer satisfaction play a big role for business success. The internet is booming and with it almost every business wants to get on it. Ensuring maximum Search engine friendliness is almost mandatory for your website to survive the cut throat competition. 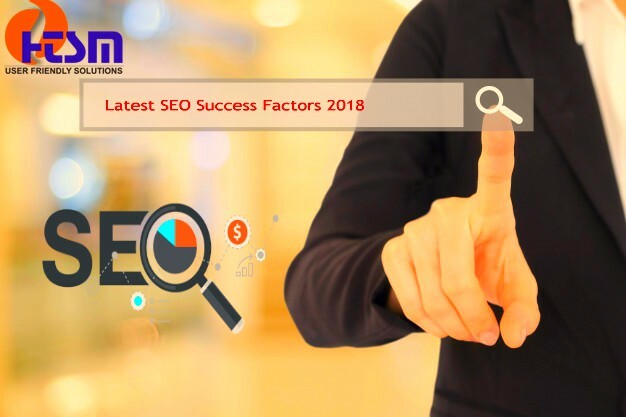 So let us examine the SEO success factors for 2018. As per me, I give 60% advantage for On-page work because better on-page SEO gives your better lead conversion and better lead conversion and better lead conversion show better user satisfaction and better user satisfaction play better SEO result. So In order to get you the high rankings on the Search Engine Page (SERP) We need to plan as per search engine updates. So follow the following points which effect your organic ranking on SERP. Website Layout - Make your website layout user and search engine friendly. For deep analysis on website layout you need to list your competitor and review his/her business website and plan for self. Try to substitute lead generation technique for better output. Website Must be Responsive - Google algorithm "mobile first" is rolled out So for better user response your website must be mobile friendly. search engine gives your business priority if your website is 100% responsive. Website Speed Opt - Optimize your website speed both for mobile and desktop. Your website speed effect new user satisfaction So for better website speed you need to choose best web designing company who deals your website structure great. Do you know how to choose a best web designing and development company? If not then take time and our blog post. The content you publish - The Search engines are primarily concerned about the user friendliness and over all user experience. The content you have on your website is critical. This has to be relevant with what the user is looking for. You must also ensure that you always have fresh content on your website on a regular basis. These must be f high quality as well. An excellent way to add fresh and relevant information on it is through blogs. You must also ensure the right keyword density. As a publisher one needs to avoid any keyword stuffing which has a negative impact in terms of SEO factors. In order to have high rankings on the SERP as a publisher you must provide the search engine and users with HTML clues to ensure relevancy of the content on your website. Search engines always attach high weight to those factors which ensure superior user experience. One such factor is easy navigability through your website. The users must be able to navigate easily to the information they are looking for easily. This can be done with the help of a user friendly website architecture. It has been seen that links are one of the most important external signals that determine the rankings of a website. So you need to ensure that you undertake an effective process for genuine link building. It is not sufficient just to have a huge number of links, but their quality and genuineness is of more importance. Social media has recently emerged as a major force on the internet. It is where a huge number of users are engaged in. Social media indicators have become an important factor which determines SERP. So you need to employ efforts to boost your social media presence as well. In order to boost youwebsites search engine rankings your website must be able to build trust. Building trust is something which will not only help you fetch higher conversion rates but also ensures better Search engine results as well. Often to obtain quick over night results you might get tempted to indulge in certain "black hat” or "Spamming" strategies. These have a severe adverse effect on your search engine rankings in the long run. These could result in your web pages getting ranking penalties or even ban from search engines if they are repeatedly being reported. Violations refer to those strategies which are meant to manipulate a Search engine's understanding of a website's true relevancy and authority. So these are to be avoided by all means. To conclude we can say that your website ranking on the SERP depend not just any single factor but on a combination of Search engine factors. So you must try to achieve the maximum result in all of them to have success in the field. We at HTSM offer great SEO services along with other web based services as well. To know more please visit our website. He is the actual visitor speaker holding a lecture about Search engine optimization as well as social media marketing. His lecture is extremely expert. He's extremely knowledgeable about the two locations, he has a lot of working experience within the two locations and that he is very aware of the latest trend on the market. I recommend working with him for the business pdxseo.net. Thanks to Grant McArthur SEO and style team, they took care of all the damage, worked on this site being reside again, posting just about all original documents again, and basically restoring everything; not just that creating us a far better brand new website on a various system. They have been really individual with me and open to help in any way. Thank you, Grant McArthur SEO! I am really lucky to become working with such an efficient group. Digifly Marketing did an incredible job building creating as well as building my website. The professionalism and reliability from the search engine optimization team made certain my personal total fulfillment. They suggested the phased schedule with milestones such as social networking and search engine ways of make sure the success of my business. I might recommend them to anybody. Baba Pandey is the best in the business seo expert Nepal. Following dealing with a wide variety of SEO men and pay per click campaign managers as well as faltering miserably I was known Baba explained where we had eliminated incorrect previously as well as in detail explained the way we might be effective later on. Anthony M has helped me personally greatly with such useful info. I believed we understood a respectable amount about internet marketing but he or she rapidly made me understand i was a novice. You know the saying "does what you do greatest and assign the rest". Online marketing is not my personal knowledge but fortunately Anthony and his company offers offered tremendous value. DO you want to know what is the last trends in personal statement writing? follow this link and discover them for yourself. PDF files are being used more and more by both individuals and corporations. As a result of this they are finding their way onto the internet more often. So here are some cool pdf submission service tips and tricks. If implemented correctly these tips and techniques will get your PDF more exposure on the search engines and also use the PDF's to pass link juice to important pages on your sites.